Josh Simpson: Glass Artist introduces not just the artist and his work, but also the inspirations and techniques that Simpson draws upon as he creates wondrous worlds from blown glass. This book provides such warm view of the artist, his family, and his work that, after reading it, you will feel as if you not only understand his work but that you know the artist personally. Paperweight collectors know Josh Simpson for his colorful and inventive worlds (Little Worlds, MegaWorlds, Planets, etc.). 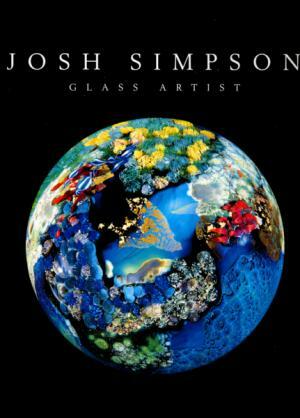 But Josh is a glass artist whose work goes beyond paperweights and the book presents an exciting view of his world. With outstanding photography and detail. The section Studio Visit describes the making of one of Josh's basketball sized megaworlds. 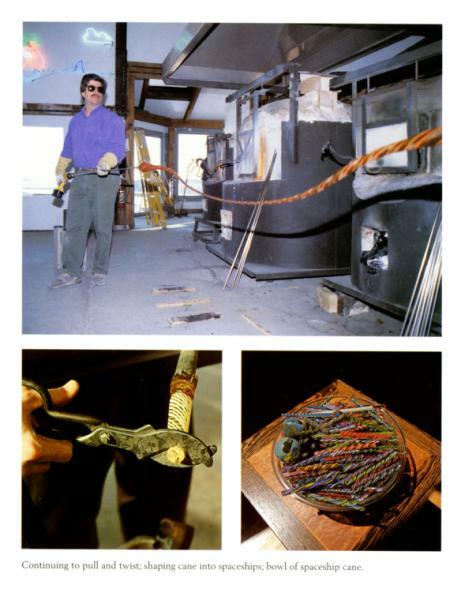 The author reviews Simpson's 30 year career as an artist and glass blower, the factors that combine to shape his art. Included are his family and his fascination with space exploration. The Studio visit shows the artist at work. The Portfolio shows the breadth of that work. 127 pages with everything in full color. 9 1/4" by 11 1/4". 2001.